Easy rasmalai recipe with step by step photo and video recipe. 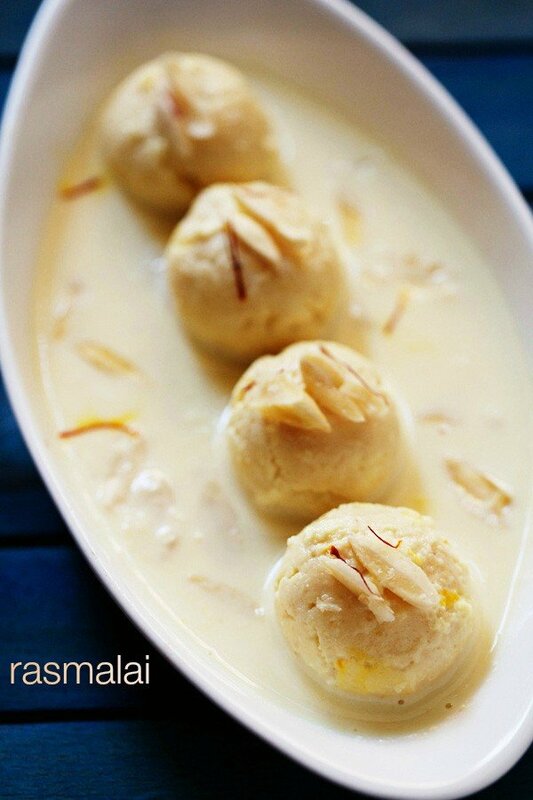 in essence rasmalai literally means juicy milk cream. this is prepared very similar to rasgulla but served with thick creamed milk flavoured with kesar. also, it is topped with choice of dry fruits including pista, kaju and badam before serving. while i am not a big fan of sweet dessert recipes. but my husband has always been a big admire of indian dessert recipes. perhaps he developed this taste for creamy based sweets during his stay in west bengal. as a matter of fact, he is so much addicted to sweets that he needs a dessert shot immediately after meal. rasmali is one such dessert which we prepare quite often. more importantly, the biggest advantage of this recipe is it lasts long for weeks if stored in fridge. also, the paneer balls can either be served as rasgulla if served with sugar syrup. and as rasmalai if served with milk cream. additionally, add lemon juice and stir till milk curdles completely. drain the curdled milk and squeeze off excess water. after 30 minutes, start to knead the paneer for 10 minutes. furthermore, make small balls and flatten. keep aside. boil the syrup for 10 minutes. after that, drop the prepared paneer balls. furthermore, squeeze of sugar syrup. firstly, heat milk and get to a boil. once a layer of cream is formed over the milk, stick it to sides of vessel. further, add sugar, cardamom powder and saffron milk. give a good mix and get to boil. further, refrigerate for 2-3 hours. firstly, pour the chilled rabri / rabdi over the squeezed paneer balls. finally garnish with few chopped nuts and allow to absorb for 2 hours.